Jeff's Baking Blog – Page 2 – Cooking is like love. Dissolve the pinch of salt in the lemon juice. Work the cold butter into a dough like consistency with the warmth of your hand. Mix the salted lemon juice into butter along with with the bread flour. I do this right next to the sink with warm water running so I can clean off my hands as needed. It can get a little messy if you’re not focused. Shape the butter block into a 6-inch square, cover with plastic wrap and refrigerate until firm (about 30 minutes). Using the dough hook in a mixer set on low, dissolve the 2 teaspoon salt and water. Add the melted butter, lemon juice, cake flour, and enough of the bread flour to make a soft, smooth dough. Do not over mix. Shape the dough into a tight ball. With a sharp knife, cut across halfway into the ball. Cover with plastic and refrigerate for 30 minutes. Peel and core the apples. Cut two-thirds of the apples into half inch pieces. Cut the remainder into one fourth inch pieces and reserve. Cook the half-inch pieces of apple in a saucepan over medium heat along with the sugar, water and lemon juice until the apples have broken down. Add the remaining one fourth inch pieces of apple and cook until they have softened but are not breaking down. Remove from heat, allow to cool and reserve. It may seem like there is not enough, don’t worry, there is. Pull the corners of the dough out to make a square. Place the butter block in the middle of the square, creating a diamond shape on top of the dough with the butter. Fold the triangles into the center of the butter block and seal the edges all the way around the block of butter. Do five single turns of the dough. This is accomplished by rolling the dough into a rectangle that is half an inch thick with a little flour to ensure it does not stick. Then fold into thirds, like you would fold a letter to put into an envelope. Refrigerate the dough for 30 minutes and repeat four times for a total of five turns. mark each turn with a light finger mark before returning it to the refrigerator to remember where you are in the process. Durring the downtime between turns, two and half hours, I make the other parts that will be needed later on (not pictured). Make the egg wash by mixing the egg and a pinch of salt in a small bowl and reserve. Mix the cinnamon and sugar in a small bowl to create cinnamon sugar and reserve for later use. Make a simple syrup by placing the sugar and water in a saucepan over medium heat and to a boil, allow to cool and reserve. Do a second turn and refrigerate for 30 minutes. Do a third turn and refrigerate for 30 minutes. Do a forth turn and refrigerate for 30 minutes. Do a fifth turn and refrigerate for 30 minutes. Roll the dough out to 1/8 inch thick, 22 1/2 inches long, and 18 inches wide. Let the dough rest for 5 to 10 minutes. Create 20 squares that are about 4 1/2 inches by cutting the dough into 5 rows of 4 squares each. Brush each square with the egg wash. Spoon about 1 tablespoon of the apple mixture in the middle of each square, sprinkle with cinnamon sugar. I have a large cutting board I roll the dough out on that is just slightly larger than the desired size. If you don’t have access to a large board roll out the dough on your countertop. Fold the squares into triangles and seal the edges by pressing lightly with your fingers. Don’t press too hard, it will break the layers created by the folding. Brush the egg wash over the top of each turnover and sprinkle with sanding sugar. In the center of each turnover cut a slit about 1 inch long. Bake at 375° for 25 minutes or until golden brown. As soon as they come out of the oven brush the pastries lightly with simple syrup. Serve warm or cold. If you wish to re-heat keep in mind the butter re-melting will damage the flaky texture but the flavor will still be good. Make the Butter Block. Dissolve the pinch of salt in the lemon juice. Work the cold butter into a dough like consistency with the warmth of your hand. Mix the salted lemon juice into butter along with with the bread flour. Shape the butter block into a 6 inch (15 cm) square, cover with plastic wrap and refrigerate until firm (about 30 minutes). Make The Dough. Using the dough hook in a mixer set on low, dissolve the 2 teaspoon salt and water. Add the melted butter, 1 teaspoon lemon juice, cake flour, and enough of the bread flour to make a soft, smooth dough. Do not over mix. Pull the corners of the dough out to make a square shape. Place the butter block in the middle of the square, creating a diamond shape on top of the dough with the butter. Fold the triangles into the center of the butter block and seal the edges all the way around the block of butter. Do five single turns of the dough. This is accomplished by rolling the dough into a rectangle that is 1/2 an inch (1.2 cm) thick with a little flour to ensure it does not stick. Then fold into thirds, like you would fold a letter to put into an envelope (see pictures above). Refrigerate the dough for 30 minutes and repeat four times for a total of five turns. Make the Apple Filling. Peel and core the apples. Cut 2/3 of the apples into 1/2 inch (1.2 cm) pieces. Cut the remainder into 1/4 inch (6 mm) pieces and reserve. Cook the 1/2 inch (1.2 cm) pieces of apple in a saucepan over medium heat along with the sugar, water and lemon juice until the apples have broken down. Add the remaining 1/4 inch (6 mm) pieces of apple and cook until they have softened but are not breaking down. Remove from heat, allow to cool and reserve. Roll the dough out to 1/8 inch (3 mm) thick, 22 1/2 inches (56.2 cm) long, and 18 inches (45 cm) wide. Let the dough rest for 5 to 10 minutes. Create 20 squares that are 4 1/2 inches (11.2 cm) by cutting the dough into 5 rows of 4 squares each. Make the Egg Wash. Mix the egg and a pinch of salt in a small bowl and reserve. Make the Cinnamon Sugar. Mix the cinnamon and sugar in a small bowl and reserve for later use. Make the Simple Syrup. Place the sugar and water in a saucepan over medium heat and to a boil, allow to cool and reserve. Brush each square with the egg wash. Spoon about 1 tablespoon of the apple mixture in the middle of each square, sprinkle with cinnamon sugar. Fold the squares into triangles and seal the edges by pressing lightly with your fingers. Brush the egg wash over the top of each turnover and sprinkle with sanding sugar. In the center of each turnover cut a slit about 1 inch (2.4 cm) long. Bake at 375° (190°C) for 25 minutes or until golden brown. As soon as they come out of the oven brush the pastries lightly with simple syrup. Place the chocolate and butter in a heat-resistant bowl, and melt together over a water bath. The water in a water bath should be simmering not boiling. Set the chocolate aside to cool so that it does not cook the eggs when they are combined later. Whip the sugar, vanilla, and eggs at high speed until light and fluffy. The fat in the egg yolk will prevent the egg whites from forming peaks, so we’re looking for a light airy mixture rather than a specific peak. Fold the cooled chocolate into the egg mixture. Sift the flour with the baking powder into the mixture and fold into the chocolate. You will want to do about a third of the flour at a time between folding it in. Fold in 12 ounces of the walnuts. If you want to add anything else you can fold it in at this point as well; the original recipe had an option of raisins, which I assume most Americans would rather skip! Spread the batter evenly in a half-sheet pan lined with parchment paper. Sprinkle the remaining 2 ounces walnuts over the top. Bake at 400°F for about 30 minutes or until completely set, but still slightly soft to the touch. Let cool, then slice into serving size pieces. After the brownies have cooled I turn the half sheet over on a cutting board and remove the paper before slicing. This will help keep your pan in good condition by not cutting it, it will also help with uniform portion sizes by portioning the whole pan at one time. Place the chocolate in a heat-resistant bowl with the butter, and melt together over a water bath. Set aside to cool. Whip the sugar, vanilla, and eggs at high speed until light and fluffy. Fold the chocolate into the egg mixture. Sift the flour with the baking powder into the mixture and fold into the chocolate, a third of the flour volume at a time. Fold in 12 ounces (340 g) of the walnuts. Spread the batter evenly in a half-sheet pan (16 x 12 inches/40 x 30 cm) lined with parchment paper. Sprinkle the remaining 2 ounces (55 g) walnuts over the top. Bake at 400°F (205°C) for about 30 minutes or until completely set, but still slightly soft to the touch. Let cool, then slice into serving size pieces. Weeks two and three covering cakes consisted of only one main lecture and a lot of time spent on skills for cutting and decorating cakes in the kitchen. I’ve combined the two weeks into one post for that reason. We covered four types of icings. Traditional American Buttercream is a mixture of sugar, shortening or butter, and milk that is combined with a paddle attachment. This type of frosting is heavy and does not pipe well. When using shortening rather than butter it leaves a film in the mouth. This is a result of butter melting at a lower temperature than shortening, which does not melt in the mouth. Swiss buttercream is the easiest to make of the two traditional buttercreams. To make Swiss buttercream egg whites and sugar are heated over a bain-marie (water bath) until they have reached 140° to 160°. The higher the temperature the harder the frosting will be. The eggs whites and sugar are then whipped on high speed until cool, which creates a swiss meringue. Butter is then added a little at a time and finally any flavorings. The more stable of the buttercreams and the most difficult to make is Italian buttercream. Sugar and water are brought to a boil and poured into whipped egg whites. The mixture is whipped until the meringue has cooled and then butter is added and flavorings. When poring the boiled sugar and water into the egg whites one must be careful as to the placement of the poor so it does not splatter all over. Both Italian and Swiss buttercream will last up to four days at room temperature. When making a cream cheese based frosting butter and cream cheese are mixed with the paddle attachment at a low speed. When the butter and cream cheese are thoughtfully combined melted chocolate or flavorings are added followed by powdered sugar. The higher the speed used on the mixer the more air is added which changes the color to a lighter color and airy texture, usually this is not what one wants with this type of frosting. In the kitchen, we covered using a cake stand to decorate and slice a cake into layers. We also learned the different methods of piping. I’ll demonstrate some of this in future postings on cakes. Cakes are a sweet variation of bread that is believed to first appeared in Greek and Roman society. In 1956 cake flour was invented by using a soft winter wheat. The base for cake is usually a sponge, consisting of its most basic form of sugar, eggs, and flour. A heavy cake has equal parts of the ingredients, like pound cake. A medium cake has less flour and sugar than eggs, like a typical sheet cake. A light cake has very little flour, more egg whites and more sugar, like an angel food cake. A higher amount of egg whites will result in a lighter sponge with a bigger crumb (holes in the cake). The higher the egg yolks the denser the sponge with smaller holes (crumb). If too little sugar is used it will affect the taste, color, and texture of the sponge, making it darker and dense. When mixing a cake the flour should be folded into the wet ingredients until it is just combined. This ensures the gluten is not overdeveloped which could result in a dense rubbery sponge. Cake flour falls as it cools, turning your cake upside down to cool will help flatten out the top of the cake. Vanilla and other liquid flavorings should be added to the wet mixture before folding in the flour mixture. Butter is sometimes used for flavor and extending the shelf life of the finished product. Melted butter that is close to room temperature should be added after the flour is folded in. Fruit and nuts should be added in at the end. To use nut flour with regular flour, replace one ounce of flour for every three ounces of nut flour added. The quantity of nut flour cannot exceed the weight of the sugar in the recipe. The sifted cocoa powder can be added for flavor with the dry ingredients. It should not exceed the weight of the flour and no more than three ounces per pound of flour. Unsweetened chocolate can be added to flavor with no more than five ounces per pound of flour. If using sweetened chocolate reduce the sugar by two ounces per pound of sugar. Fold the melted chocolate in after the flour in three stages, with the first fold being only a small amount. There are two common methods of making cakes, the warm and the cold method. In the warm method eggs and sugar are combined over a water bath until all the sugar dissolves. The eggs and sugar are then whipped on high until ribbon stage and then the dry ingredients are folded in. Sometimes melted butter or oil are added after the folding to produce a more moist cake. The fat in butter also acts as a preservative prolonging the shelf life of the cake. If no fat is added the cack usually must is moistened with a glaze. A common type of warm cake is a genoise. The cold method is a separated egg sponge. Egg yolks are whipped with sugar and set aside. The egg whites are whipped with sugar to a specified peak and then folded into the egg yolk mixture along with the dry ingredients. This creates a lighter and sweater sponge than the warm method. Common cold method cakes are angel food cake and chiffon cake. Both methods produce a cake that has finished baking when a toothpick inserted into the center of the cake is clean when removed, or the middle of the cake springs back when touched. When baking sponge of either method the pan should not be greased, this ensures the cake will raise up the side of the pan and not fall. Parchment on the bottom of the pan will ensure minimal sticking. Use a small knife to remove the cake from the sides of the pan. If you modify a recipe and are afraid it won’t raise properly you can add up to two teaspoons of baking powder for every 12 eggs used. Don’t use baking soda, you will need to add an acid to your recipe for it to work. Cakes are generally baked between 350° and 400°. When using a cake recipe for cupcakes increase the temperature and decrease the total baking time. Likewise when using a cupcake recipe and converting it to a cake recipe decrease the temperature and increase the baking time. Cooling either type of sponge is part of the baking process and should be allowed to complete before serving or decorating. Fall is here and the second part of my Bakeshop Skills class has begun. The first class was basic orientation, but we did cover a basic primer on cakes for next week. The class looks like it will be another interesting and eventful 100 hours. The owner of the company I work for recently celebrated his birthday. Carrot cake is one of his favorites. Having never made a Carrot cake before I set out to my usual books to see what I could come up with. Bo Friberg’s Carrot Layered Cake with Cream Cheese Filling fit the bill nicely. It’s well worth the time and effort. Several of those receiving a piece let me know it was the best carrot cake they had ever had. This cake took me close to 8 hours to complete, so compliments were both a relief and an encouragement. If you ever wanted to try something ambitious in the home kitchen here is your chance. This recipe is both time and labor intensive. In a commercial bakery, all the parts would most likely already be available making the time needed to complete much less. In a mixing bowl using the whisk attachment whip the eggs at high speed to a light and frothy consistency. Reduce the mixer speed to medium and gradually add the oil. Turn the mixer speed to low and mix in the sugar and salt. Mix until combined. Sift together the flour, cinnamon, baking soda, and baking powder. I used a fine grade strainer for this rather than a traditional sifter. The main reason to sift is to ensure the ingredients are not lumpy and are evenly distributed. Add to the egg mixture and mix until combined. Fold in the carrots and walnuts, evenly distributing them into the batter. Pour batter into a 10-inch greased cake pan. I use an oil spray and a parchment paper round on the bottom to ensure it does not stick to the pan. I saved the original cardboard liner in the pan to use as a template for both paper and the Marzipan in this recipe. Bake at 375°F for about 30 minutes or until the cakes spring back when pressed lightly in the center. Allow the cake to cool. It’s important the cake has cooled completely before attempting to work with it. If it is not cool enough it will be difficult to both cut the top off and slice into layers. 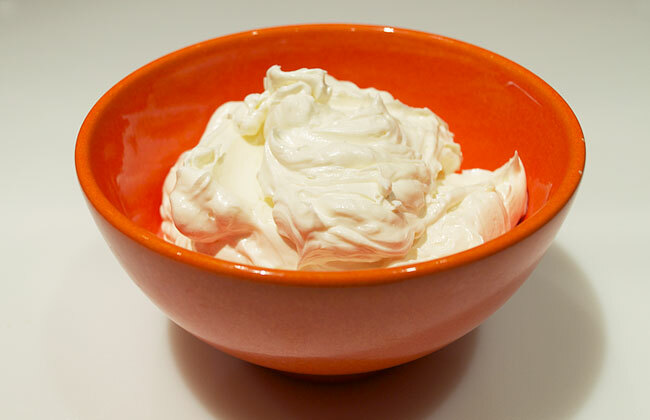 Soften the cream cheese, using the paddle attachment of an electric mixer.Use a slow speed so no additional air is added to the cream cheese. Add the butter and blend until the mixture is smooth. Add the vanilla and powdered sugar. Mix until smooth and spreadable. Cut the top off the carrot cake to make it level (again – make sure the cake is completely cool before doing this). Evenly cut the cake in half horizontally. Evenly spread the cream cheese filling over the top of the bottom half of the cake. Place the top portion on top of the filling. Make sure the layers line up or you will end up with odd shaped individual pieces when they are cut later on. Frost the top of sides of the cake with the buttercream. You can use any vanilla buttercream recipe you like or a store purchased buttercream if you are pressed for time. 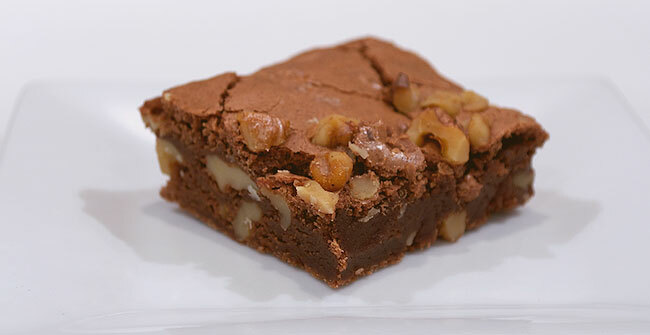 Cover the sides of the cake with the crushed hazelnuts. Roll out 5 ounces of the marzipan, using powdered sugar to prevent it from sticking to 1/8 inch thick. I used a lot of powder sugar to roll it out, the day was very warm and the Marzipan kept falling apart. One of the main ingredients of Marzipan is powdered sugar, so don’t worry about using too much. Cut out a circle the same size as the top of the cake and place it on top of the cake. As mentioned above I used the cardboard insert that came with the pan as a template for this. You can make your own by tracing the bottom of your cake pan and cutting into size. Invert the cake on a cardboard round and refrigerate upside down for no more than two hours. I used a heavy layer of powdered sugar to ensure the Marzipan would not sweat and stick to my cardboard. You don’t want to leave this in the fridge for more than two hours or it will start to stick. Color 1/2 ounce of the marzipan green. Combine the red and yellow food coloring to tint the remaining 2 ounces of marzipan orange. Cover and reserve. If you don’t cover it the Marzipan will dry out. Roll the orange marzipan into a 9-inch rope and the green into a 4 1/2-inch rope. Cut the orange and the green ropes into 12 equal pieces. Cover with plastic wrap. Roll the orange pieces into round balls. Roll each ball into a cone shape about one inch long by rolling them back and forth against the table. With toothpick make a slight indentation on top for stem. For each green piece of marzipan roll into a 1/2 inch (1.2 cm) string. Tapper the string on both sides. Cut and fan the green end to resemble a carrot top. With a toothpick make horizontal lines around each piece of the orange Marzipan carrots. Insert on end of the stem into the hole of the carrot. If they don’t stick use a little water on the tip of the green Marzipan before inserting the green stems. Remove the cake from the refrigerator. Turn the cake right side up, remove excess powdered sugar and cut it into the desired number of servings. I created a template to get 12 even pieces. The cake is easiest to cut when cold. 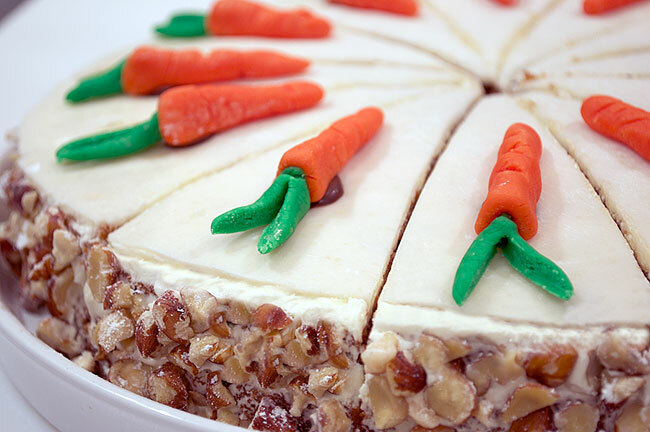 I recommend pre-cutting the cake at this point, but there is no reason you could not slice it when you serve it (as long as the marzipan carrots are placed evenly for the number of pieces you need). Pipe a dime-sized dot of the melted coating chocolate on each slice, 1/2 inch away from the edge. Place a marzipan carrot on top of each of the chocolate spots. You can use white chocolate for this as well if you want to “hide” how the carrots are stuck to the Marzipan. You may want to use these recipes for Buttercream and Marzipan (or use your own or store bought). In a mixing bowl with the whisk attachment whip the eggs on high until a light and frothy consistency. Reduce the speed to medium and gradually add the oil. Turn the speed to low and mix in the sugar and salt. Sift together the flour, cinnamon, baking soda, and baking powder. Add to the egg mixture until incorporated. Fold in the carrots and walnuts, evenly distributing them into the batter. Pour batter into a 10 inch (25 cm) prepared cake pan. Bake at 375°F (190°C) for about 30 minutes or until the cakes spring back when pressed lightly in the center. Allow the cake to cool completely. Soften the cream cheese, using the paddle attachment of an electric mixer. Add the butter gradually, blending until the mixture is smooth. Add the vanilla and powdered sugar. Mix until smooth and spreadable. Cut the top off the carrot cake to make it level. Evenly cut the cake in half horizontally. Evenly spread the cream cheese filling over the top of the bottom half of the cake. Place the top portion on top of the filling. Frost the top of sides of the cake with the buttercream. Cover the sides of the cake with the crushed hazelnuts. Roll out 5 ounces of the marzipan, using powdered sugar to prevent it from sticking, to 1/8 inch (3 mm) thick. Cut out a circle the same size as the top of the cake and place it on top of the cake. Invert the cake on a cardboard round and refrigerate upside down for two hours. Color 1/2 ounce (15 g) of the marzipan green. Combine the red and yellow food coloring to tint the remaining 2 ounces of marzipan orange. Cover and reserve. Roll the orange marzipan into a 9-inch (22.5 cm) rope and the green into a 4 1/2-inch ( cm) rope. Cut the orange and the green ropes into 12 equal pieces. Cover with plastic wrap. Roll the orange pieces into round balls. Roll each ball into a cone shape about 1 inch long by rolling them back and forth against the table. With a toothpick make horizontal lines around the carrot. Dip toothpick in oil if sticking to marzipan. With toothpick make a slight indentation in top for stem. For each green piece of marzipan roll into a 1/2 inch (1.2 cm) string. Tapper the string on both sides. Insert the end of the stem into the hole of the carrot. Cut and fan the green end to resemble a carrot top. Remove the cake from the refrigerator. Turn the cake right side up, brush off excess powdered sugar and cut it into the desired number of servings. Pipe a dime-sized dot of the melted coating chocolate on each slice, 1/2 inch (1.2 cm) away from the edge. Place a marzipan carrot on top of each of the chocolate spots. There are probably thousands of recipes for buttercream. This recipe uses what is known as the Swiss method. The eggs are pasteurized by heating them, along with sugar, to 140°C (60°F). The eggs and sugar are then whipped until they have reached stiff peaks and have cooled off enough to add the butter without it melting. The end result is a very light and versatile icing that is easy to work with. The flavor of the frosting can be can be changed by replacing the vanilla extract with any other flavor. Thoroughly combine the butter with the margarine. If your butter or margarine is cold wait until they have reached room temperature before mixing them together. Reserve at room temperature. Combine the egg whites and the sugar in a non-reactive heat-resistant mixing bowl. Place the bowl over simmering water and heat while constantly whipping, to 140° (60°C). Remove from the heat and whip the mixture at high speed with the whisk attachment until it forms stiff peaks and is lukewarm, lower the speed to medium, add the vanilla, and gradually whip in the butter mixture. In a small bowl mix the butter with the margarine until thoroughly combined. Reserve at room temperature. Place the egg whites and the sugar in a non-reactive heat-resistant mixing bowl. Place the bowl over simmering water and heat while constantly whipping, to 140° (60°C). Remove from the heat and whip the mixture at high speed with the whisk attachment until stiff peaks form and the mixture is lukewarm, lower the speed to medium, add the vanilla or other flavorings, and gradually whip in the butter mixture until the frosting comes together. Marzipan is a combination of sugars and almonds that have been crushed to a powder. It’s used as a filling, frosting, and even candy. When I lived in Norway I would eat Marzipan straight from the tubular packaging it came in at the grocery store. Scandinavian countries use Marzipan molded in the shape of a pig around the holidays as a special treat. A rice pudding is served with a single hidden almond in the pudding. The child who discovers it wins a marzipan pig. The pig represents wealth since in old times the amount of livestock a family owned determined its wealth. Rather than show how to make Marzipan every time it is used in a recipe, I have decided to make one master post on it and link back to this post when it is used. This is a fairly simple process if you have the right equipment. If you do not have a food processor you can purchase Marzipan in most grocery store’s baking aisle. First we are going to make simple syrup, which is fifty percent water and fifty percent sugar. You can buy this at the grocery store, however its very expensive considering it’s ingredients. Bring the water and granulated sugar to a boil for 30 seconds in a small saucepan. Allow to cool and reserve. Don’t boil this longer than needed because it will lose water content the longer it boils. Place the almonds in a food processor and process to a powder. Be careful that you do not process too long and create almond butter. Mix in 5 1/2 ounces powder sugar. With the machine running, gradually add the reserved sugar water and mix until a paste is formed. The simple syrup needs to cool to room temperature or barely warm before adding it. You may not need to add all the simple syrup if your almonds have recently been blanched and contain some residual moister. In a mixing bowl fitted with the hook attachment, mix the paste with the corn syrup at low speed until combined. Be use to use a non-reactive clean mixing bowl. Marzipan is white and will show any dust or reaction to metal. Add the 1 pounds sifted powdered sugar a little at a time. I use a cup and do about four additions. Scrape down the sides of the bowl as necessary until a smooth dough has formed. Store in an airtight container. This will keep for a long time when airtight. Marzipan does not need to be refrigerated. Bring the water and granulated sugar to a boil for 30 seconds in a small saucepan. Allow to cool and reserve. Place the almonds in a food processor and process to a powder. Mix in 5 1/3 ounces of powder sugar. With the machine running, gradually add the reserved sugar water and mix until a paste is formed. In a mixing bowl fitted with the hook attachment, mix the paste with the corn syrup at low speed until combined. Add 1 pounds sifted powdered sugar a little at a time, scraping down the sides of the bowl as necessary until a smooth dough has formed. Store in an airtight container. There is nothing in the world like the smell of freshly baked bread. Unfortunately, there is no way of embedding the smell into a webpage. This bread not only smells wonderful but taste amazing. This picture is deceiving, each piece is about six inches long. I used this bread as the base for an open face tuna melt, french toast, and as sandwich bread. All three were really good uses. It’s also great on its own, toasted, or with some jam or butter. I will definitely be making this one again. The original recipe called for table salt. I replaced it with kosher salt, which can easily be done by weight. I highly recommend a scale for weighing ingredients. If you don’t have one and want to use table salt reduce the total volume by a third (or in this case use two teaspoons). In a saucepan combine the milk, kosher salt, and butter. Bring to 115°F (46°C). Set aside. Don’t get it hotter than this or it will kill the yeast. In a mixing bowl, fitted with the dough hook, dissolve the yeast in the warm water. Use a whisk to quicken the time needed to dissolve the yeast. Add the milk mixture, whole wheat flour, and all but about 1/3 a cup if the bread flour. Mix at low speed, for about 8 minutes, add the reserved bread flour if needed. I added mine in at about two minutes when I could see the dough was still sticking to the sides of the bowl a lot. This is a wet and sticky dough at first so don’t over do it on the flour. The dough should reach a smooth, elastic, glutinous consistency, but will still be a little wet. Cover the dough with plastic wrap and place in a warm spot until it has doubled in volume. It was a nice warm sunny day here in San Diego, I placed mine in a sunny window. I also sometimes place it on top of the stove or in the oven that’s been pre-heated to 200°F and turned off for 10 minutes. Punch down the dough, I used a little flour to keep the dough from sticking to my hand. Cover, and allow to double in volume again. Once the dough has doubled in size again punch it down and divide the dough evenly into two portions. Flatten with your hands into a 12 by 6-inch square. It does not have to be perfect. Roll up the dough and seem it on the underside. Place both loaves on a baking sheet. Mix the egg and the 1/8 a teaspoon of salt and coat the dough with it. Sprinkle whole wheat flour over the top. Allow the loaves to rise until they are almost double in volume. Using a sharp knife make three slash about 1/4 an inch deep lengthwise on each loaf. Bake for 10 minutes at 410°F (210°C). After each minute spray water into the oven on the bread for about 5 seconds. Reduce the temperature to 400°F(205°C) continue baking for 30 minutes, until dark golden brown. Cool on a rack. 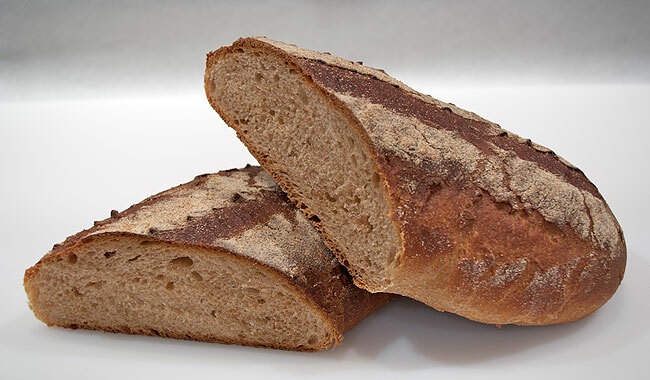 If you want to check out some amazing breads, be sure to check out YeastSpotting on the Wild Yeast blog. a saucepan combine the milk, kosher salt, and butter. Bring to 115°F (46°C). Set aside. In a mixing bowl, fitted with the dough hook, dissolve the yeast in the warm water. Add the milk mixture, whole wheat flour, and all but about 1/3 a cup if the bread flour. Mix at low speed, for about 8 minutes, add the reserved bread flour if needed. The dough should reach a smooth, elastic, glutinous consistency, but will still be a little wet. Cover the dough with plastic wrap and place in a warm spot until it has doubled in volume. Punch down the dough, cover, and allow to double in volume again. Divide the dough evenly into two portions. Flatten with your hands into a 12 by 6-inch square. Roll up the dough and seem it on the underside. Place both loaves on a baking sheet. Mix the egg and the 1/8 a teaspoon of salt and coat the dough with it. Sprinkle whole wheat flour over the top. Allow the loaves to rise until they are almost double in volume. Using a sharp knife make three slash about 1/4 an inch deep lengthwise on each loaf. Bake for 10 minutes at 410°F (210°C). After each minute spray water into the oven on the bread for about 5 seconds. Reduce the temperature to 400°F(205°C) continue baking for 30 minutes, until dark golden brown. When you hear the words “Strawberry Shortcake” what comes to mind? If your an American, it’s likely you have had Angel Food cake with Cool Whip and strawberries. That is not what we are making here. Shortcake is really a biscuit. The name Shortcake comes from the fats in the biscuit that keep the gluten from forming long strands. 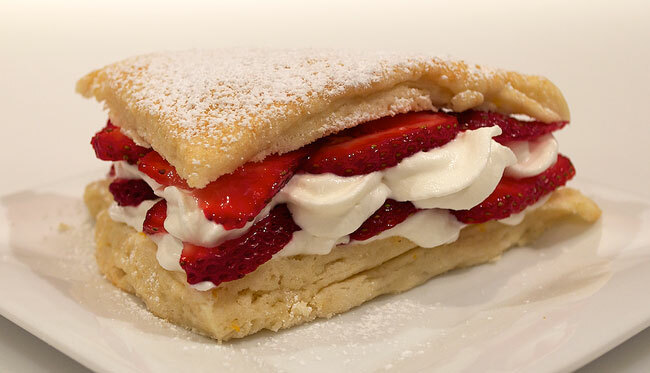 A true Strawberry Shortcake is a biscuit with whipped cream and strawberries. Making the shortcake, the biscuit part, from scratch makes all the difference in the world. Once you have made it from scratch you won’t want the supermarket version of this dessert again. Feel free to make the biscuits ahead of time and/or clean and slice strawberries ahead of time. These taste best the same day you assemble them. If you want a sweeter version, add more sugar to the cream and place more sugar on top of the egg washed biscuits before baking them. I quadrupled the recipe for a special event, so the amounts in the picture are not per the recipe. Sift together the flour, salt and baking powder in your mixing bowl. (You could use a whisk instead.) Using the paddle attachment add the butter and mix until the butter is the size of peas. 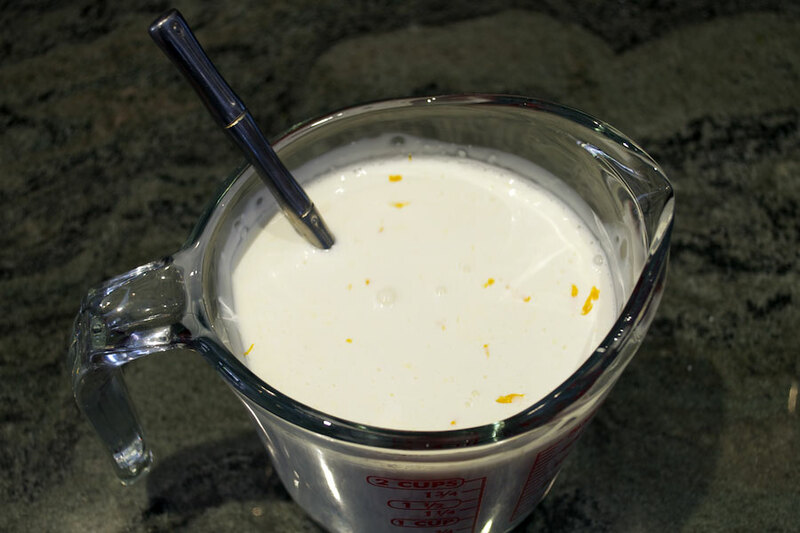 Stir the orange zest into the cream and pour into the flour mixture. Mix only until a soft dough is formed (this takes less than 20 seconds, don’t over mix). Place dough on a floured work surface. Using your hands pat out to a 6-inch square and give the dough a single turn. Roll the dough into a rectangle measuring 3 1/2 x 9 inches and about 3/4 an inch thick. Cut the stip of dough in half lengthwise. Cut each half into 4 triangles and place on a parchment-lined baking sheet. Brush the tops with the egg wash, then sprinkle with the granulated sugar. Bake the biscuits at 400°F (205°C) for about 15 minutes. Cool baked biscuits on a rack. Clean and hull the strawberries. Cut the berries into thin slices lengthwise, cover and save for later. You can prepare the strawberries ahead of time or while the biscuits are baking. Whip the heavy cream, 4 teaspoons (20 g) sugar, and vanilla until stiff peaks form. Depending on the sweetness of your strawberries, or if you prefer a sweeter version, you may want to add more sugar than the recipe calls for. Place in a pastry bag with the tip of your choice. Cut one of the biscuits in half horizontally. Pipe the whipped cream onto the bottom half, coving it with a zig-zag pattern. Cover the cream with sliced strawberries. Pipe a second layer of cream on top of the berries. Make a second layer of berries. Place the top of the biscuit on the top and dust with powdered sugar. Repeat with the remaining biscuits. Sift together the flour, salt and baking powder in your mixing bowl. Using the paddle attachment add the butter and mix until the butter is the size of peas. Stir the orange zest into the cream (1 & 1/2 cups + 2 Tablespoons) and pour into the flour mixture. Mix only until a soft dough is formed (this takes less than 20 seconds, don’t over mix). Place dough on a floured work surface and using your hands pat out to a 6-inch (30-xm) square and give the dough a single turn. 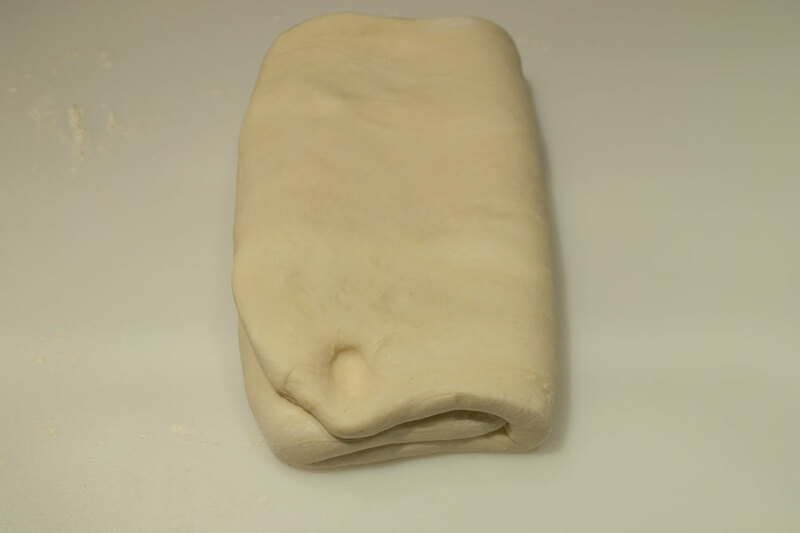 Roll the dough into a rectangle measuring 3 1/2 x 9 inches (8.75 x 22.5 cm) and about 3/4 an inch (2cm) thick. Cut the strip in half lengthwise. Cut each half into 8 triangles and place on a parchment-lined baking sheet. Brush the tops with the egg wash, then sprinkle with the granulated sugar. Bake the biscuits at 400°F (205°C) for about 15 minutes. Cool on a rack. Clean and hull the strawberries. Cut the berries into thin slices lengthwise, cover with plastic wrap and reserve. Whip the heavy cream, 4 teaspoons (20 g) sugar, and vanilla until stiff peaks form. Place in a pastry bag with the tip of your choice. Cut the biscuit in half horizontally. Pipe the whipped cream onto the bottom half, coving it with a zig-zag pattern. Cover the cream with sliced berries. Pipe a second layer of cream on top of the berries in a zig-zag. Make a second layer of berries. Place the top of the biscuit on the top and dust with powdered sugar.